Véronique Gens has easily one of the most exquisite voices in the business today; moreover anything she does is uncommonly intelligent and musically informed. With this recording Naxos enters the echelons of upmarket performances. In this material, Gens outclasses Kiri te Kanawa in terms of vocal beauty and is in an altogether different league interpretatively. She is even a match for the venerable recording made by the late Victoria de los Angeles. Indeed, she may even have an edge over her competitors, for Gens is a native of the Auvergne. She would have grown up well aware of the history and traditions of regional culture. I have no idea whether she speaks the dialect, but her way with these texts is natural and instinctive. In our age of cultural homogeneity, it's hard to appreciate what regional identity meant in an earlier age, and how important it was. 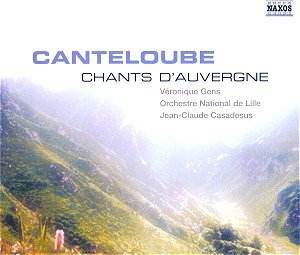 Canteloube was called "le bard d'Auvergne" because he was passionately involved in preserving the folklore and music of his native land. At the turn of the century many composers returned to folk idiom for inspiration � Vaughan Williams, for example � but Canteloube was himself a genuine man of the people, so to speak, who had grown up in the countryside. When he went to farms and villages to collect folk music, he could communicate as an equal, without condescension. His music therefore has a particularly vivid, exotic feel to it. There are echoes of a musical tradition outside the mainstream, shaped by the mountainous isolation of many parts of the Auvergne. Many of Canteloube's songs are also informed by "medieval" music, and the romance of the troubadour tradition. The Trois Bourrées could have stepped out from a medieval fair. This is yet another reason why Gens carries this music off with such verve; her background is in early music and the baroque. She approaches songs like Lou bousu and Malurous qu'o uno fenno with vigour, understanding the earthy nature of pre-modern music. These songs are not technically challenging, but they need to be sung without affectation or condescension.